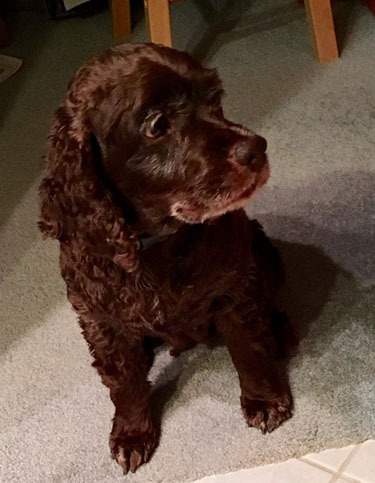 Emma [Adopted April 2016] is a very sweet petite, 7 year old chocolate female cocker. She spent her early years having babies for an Amish farmer. She was so friendly that she was also a playmate for his children. She's very shy when she's in new surroundings but quickly responds to love and is soon your favorite lap dog. She is crate trained and we do crate her when we leave for any length of time. She sleeps through the night in a nice doggy bed in our bathroom. She would be best living in a home where she can go outside a couple times a day. She loves chewing on her antler to keep her busy. She just learned how to walk on a leash and loves it. 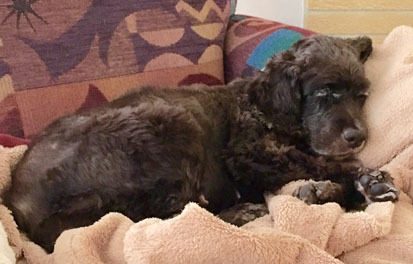 Emma is a very loving dog that deserves to live a real dogs life, could she join your family?